HERE IS A VERY NICE FIND FOR YOUR VINTAGE SUZUKI RV125 TRACKER FITS 1973 THRU 1977, NOS REAR CARRIER RACK JUST REMOVED FROM THE BAG FOR PHOTOS.. 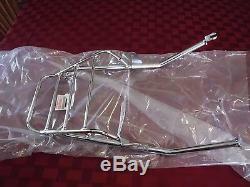 The item "SUZUKI RV125 NOS REAR CARRIER LUGGAGE RACK OEM RV 125 CHROME NEW TRACKER" is in sale since Sunday, September 9, 2018. This item is in the category "eBay Motors\Parts & Accessories\Motorcycle Parts\Antique, Vintage, Historic". The seller is "sc-jo" and is located in Chichester, New Hampshire. This item can be shipped to United States, Canada, United Kingdom, Denmark, Romania, Slovakia, Bulgaria, Czech republic, Finland, Hungary, Latvia, Lithuania, Malta, Estonia, Australia, Greece, Portugal, Cyprus, Slovenia, Japan, Sweden, South Korea, Indonesia, Taiwan, Thailand, Belgium, France, Hong Kong, Ireland, Netherlands, Poland, Spain, Italy, Germany, Austria, Mexico, New Zealand, Philippines, Singapore, Switzerland, Norway, Saudi arabia, United arab emirates, Qatar, Kuwait, Croatia, Malaysia, Colombia.